1 SEASON chicken, if desired, with salt and pepper. Heat 1 tablespoon oil in large nonstick skillet over medium-high heat and cook chicken, stirring occasionally, until chicken is thoroughly cooked, about 5 minutes, adding garlic during last 30 seconds cook time. Remove and set aside. 2 HEAT remaining 1 tablespoon oil in same skillet and cook onion, squash and Brussels sprouts until vegetables begin to soften and start to brown, about 5 minutes. 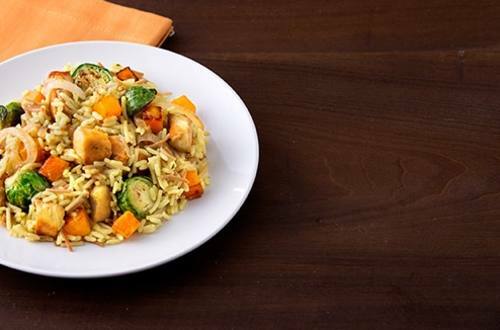 3 STIR in Knorr® Rice Sides™ - Chicken flavor and prepare according to package directions. Stir in cooked chicken.